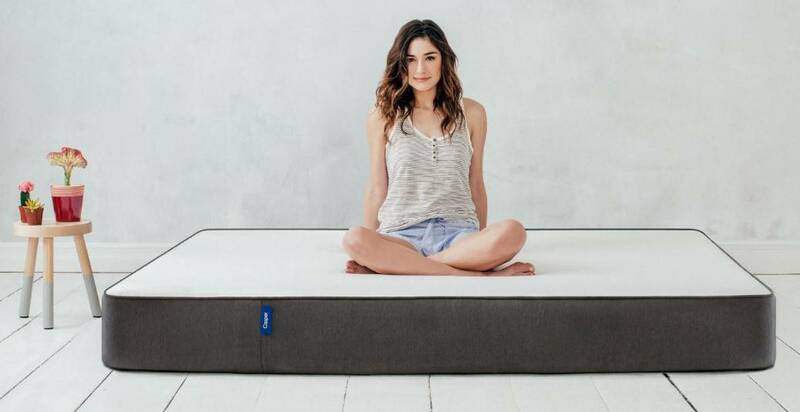 Casper and Helix are two of the most competitive mattress companies currently catering to customers in the United States. Casper has established itself as one of the most popular online mattress designs in the country. Helix has entered the market relatively recently – it was started by three entrepreneurs in just 2014. But the company has quickly risen to star status as they’ve successfully targeted multiple market segments. On this page, we will compare these two mattress brands to help you determine which may be the best option for you. As mentioned previously, Helix has been in operation since 2014. The company has been able to make significant headway in the industry by providing their clients with the opportunity to fully customize their mattress. Despite the size of the mattress market in the United States, mattress customization is not common place. This means that Helix mattresses cannot be reviewed as a single product – all their capabilities must be considered when deciding if this is the right mattress for you. You will receive your Helix mattress in the mail within 6-10 days of ordering – an impressive turnaround considering that it is fully customized. You will also receive a 10-year warranty with your mattress. They also have a show room in New York City if you live in the area and want to check their mattresses out in person. Because these mattresses are customized, there isn’t a single unique construction method that Helix uses to create their mattresses. They want to make sure that they are able to construct a mattress that is best suited to your individual needs – they put you in the driver’s seat of your mattress design. This isn’t to say you need to be a design expert, they know how to help you get exactly what you’re looking for. While each mattress will differ in design, the materials used to construct them will be the same. 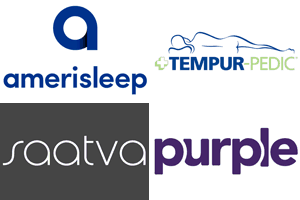 We’ll take a look at the different materials that Helix use to help create the perfect mattress for you. The top layer is typically made from highly responsive poly foam – although Helix use their own version of this form of foam which is called Helix Dynamic. You can only get this form of poly foam is you order a Helix bed. The thickness of this layer will be dependent on the customizations you make to the bed. Microcoils typically make up the second layer of the Helix mattress. These provide an extra bit of bounce and response for those who are sleeping on the bed. The third layer is another layer of the poly foam that was mentioned in the top layer. This provides a nice transition before the mattress reaches its support stage. The last layer is the support layer – it allows the rest of the mattress design to focus on comfort, rather than stability. 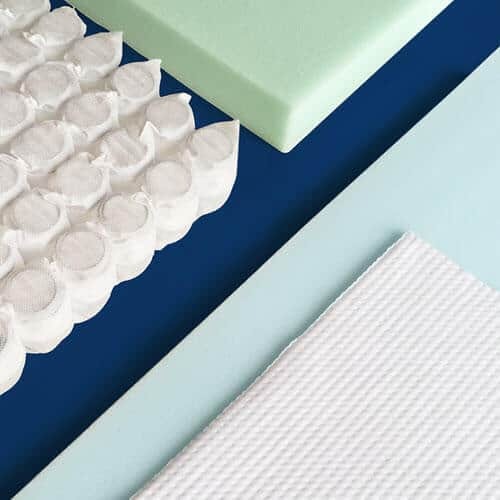 This part of the mattress is manufactured using extremely dense foam – this gives it the strength it needs to provide a supported sleep for the owner of the mattress. It is the unique combination of these layers that will result in your fully customized mattress. There is a survey on their website which will provide you with all the tools you need to understand what kind of customization is best for you. 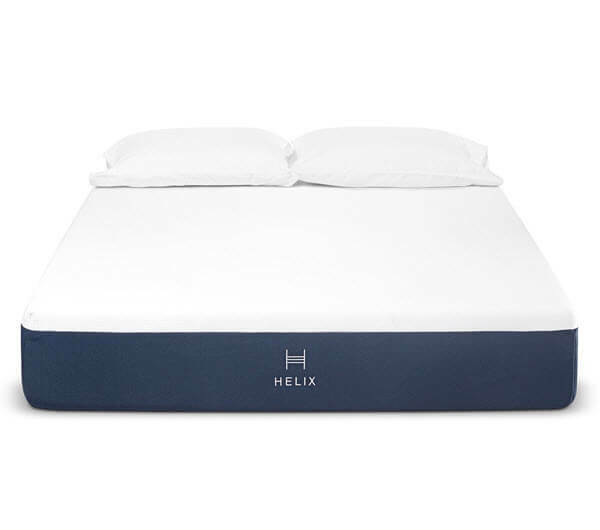 Unlike many other mattress producers, the Helix cover is made from pure Polyester, though it must be mentioned that the sides are markedly thicker. This is because Helix wants the cover to give extra edge support to the mattress. They’ve made sure that the cover doesn’t have too much density – they don’t want to add any extra heat retention to the design. Point Elasticity – This is a measure of what pressure on part of the mattress impacts other parts of the mattress. It will determine the amount of hug and the motion transfer that may impact your partner’s sleep. We typically give our mattress reviews a score of between 0-10 for mattress firmness. Due to the customization of Helix mattresses, these scores range from 3-9 – meaning you’re able to find a mattress of almost any support level. This form of mattress would score at around 5 on our 1-10 scale. This leaves it right in the middle – it’s perfect for someone who doesn’t have extreme preferences. It’s also a great choice for someone that has a normal weight distribution. The mattress layers would be 2” of top layer, 2.4” of second layer, 2” of third layer, and 4” of support layer. This is a mattress that is also designed for a range of different sleeping positions, as with the first type of mattress, it’s best for someone with an average weight distribution. It is slightly more firm than the first mattress, but not by much. This falls into similar category with Type 2, but it is designed to suit those who weigh less than average. It gives a bit less support than type 2, which means it may be unsuitable for someone who is heavy. This is a mattress that is designed to have as much support as possible. If you are a heavy sleeper, this is the first choice you should make. Having a mattress with these qualities will ensure that you don’t sink too far into the mattress – it will keep your spine straight. Choosing the right model will be down to your own preferences. Make sure to answer the survey honestly so that Helix can get you the perfect mattress. Also, Helix offers a unique customization method that allows you to differentiate your mattress so that you and your partner can enjoy your personal preferences. Chances are you don’t have the exact same sleeping requirements as your partner, having a mattress split down the middle is the perfect solution to this problem. You can also have both of your surveys melded together to create a single mattress that is suitable for both partners. As you can see, Helix mattresses come in around the same price as many other top-end mattresses. You can also take advantage of various promotional offers, as well as pay your mattress off over installments of different time periods if this is more suitable for you. Casper mattresses have grown increasingly popular in recent years, they’ve been around a fair bit longer than the Helix mattress. Unlike Helix, Casper doesn’t offer a wide variety of customizations – instead, they focus on creating a single mattress that has an exceptional composition for a variety of people. If you do decide to purchase a Casper mattress, you’ll get a full refund in the first 100 days if you decide you’re not satisfied with the mattress. In addition, you will receive a 10-year warranty on the mattress that you purchase. Lastly, you’ll also receive free shipping straight to your door. Like the Helix, Casper uses four separate layers to produce their mattresses. This allows them to take advantage of a range of different material, each which provide their own unique advantages to the mattress owner. We will explore each of these layers and materials in more detail below. This layer is responsible for making the sleeper’s contact with the mattress as comfortable as possible. It’s 1.5” thick and consists of poly foam. It’s in place to provide maximum comfort and response. This layer is also 1.5”, but is made from memory foam instead. This part of the mattress also prioritizes comfort. Unfortunately, memory foam tends to absorb heat which can make the mattress quite hot to sleep in. For this reason, Casper has made this the second layer so the top layer can allow the mattress to remain cool and breathable. This layer is that exact same measurements and material as the first layer of the mattress, but it serves a different purpose. This is a transition layer between the second and bottom layer. It’s the perfect material to help add breathability and comfort. As with any mattress, this is the support layer. It is made from extremely dense foam that is designed to give the rest of the mattress the support it needs. Without this layer, you would simply sink to the bottom of the mattress. This layer is 5” thick. The total thickness of the mattress is 9.5”. As you can see, the different compositions allow for a mattress design that is truly versatile – each material serves its own purpose. Many mattresses are made with memory foam, but having a memory foam mattress can result in overheating due to its ability to retain warmth. That’s why this mattress is so unique, it provides breathable materials that counteract the impact of the memory foam. The cover for the Casper mattress is pretty minimalist. It is a plain white across the top of the cover and is made from an extremely stretchy and durable material. This allows for the cover to be worn down and still maintain its elasticity. 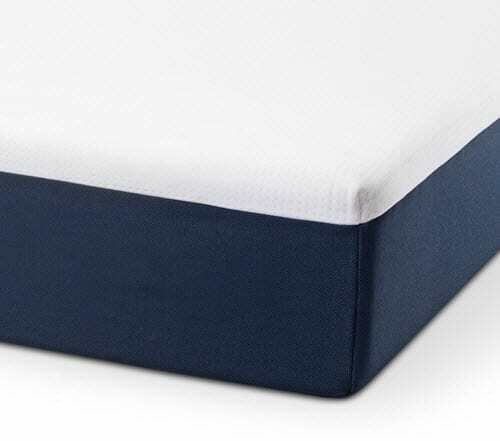 This also ensures that sleepers don’t get too hot from the mattress cover – it ensures that it is breathable as well. The basic design of the cover may seem lazy, but it was done with purpose. Having a thin, elastic cover means that you don’t lose the properties of the mattress. Instead, you get to feel the textures that make this mattress so special. There is no denying that his mattress is extremely comfortable – it’s the comfort that has made Casper into a well-known brand within the United States. In terms of support, Casper stays away from the extremes. On our scale of 1-10, Casper was ranked at about a 6 – meaning it’s fairly close to the middle of the pack. This is a great mattress for those who are an average weight, or underweight. If you weigh more than 250 pounds you may find that this mattress doesn’t provide you with the support that you need. A custom Helix mattress may do a better job of meeting your demands. As you can see, Casper has very similar prices to Helix, and also offers financing to customers who don’t want to have to pay for the entire mattress upfront. There are also no additional charges or fees as shipping is included in the cost of the mattress. As you can see, there is a lot to like about both of these mattress choices. Casper has become extremely popular amongst people within normal weight parameters. This being said, Helix allows a level of customization that is not seen by almost any other producer. If you find that you need something that lies outside of a normal mattress’s provisions, a Helix mattress is typically a great choice. This is especially true if you happen to have a sleeping partner that has different preferences to you – you can enjoy a mattress that is manufactured for two separate people.